Quantities will vary based on how many people you wish to serve. 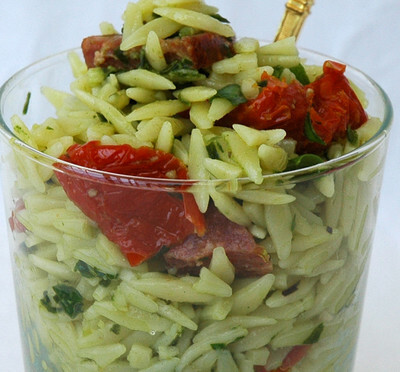 To cooked orzo add pesto, cubed chorizo sausage, chopped sun dried tomatoes, freshly shredded basil, salt, pepper, oil and lemon juice. Pretty simple really. 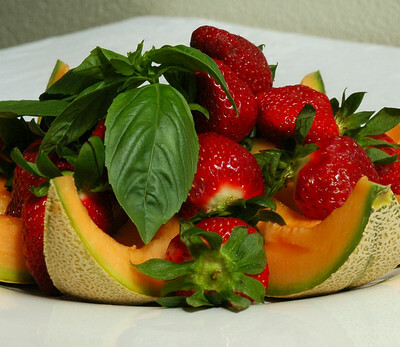 White platter...sliced rock melon, strawberries and basil sprigs. Did you know strawberries are one of the items shown to consistently retain higher levels of pesticides. I fill my sink with water, add fruit and vegetable wash, strawberries, wash well and then rinse well before serving. Now if I was really organised I would have posted a picture of my packed suitcase here. Today I'm not that organised. I decided to have my nails done instead. So I'm sitting here with beautiful nails and even more beautiful pink painted toes and an unpacked suitcase. Tomorrow Bryan and I fly to Perth in Western Australia to spend Christmas and New Year with my family and friends. 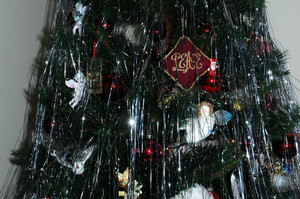 Our children will join us the following week for Christmas. I'll be back on 5th January. I've written a few posts, which by the magic of Typepad, will pop up while I'm away. I'll still be popping in on my favourite blogs while I'm away to see what everyone is up to. 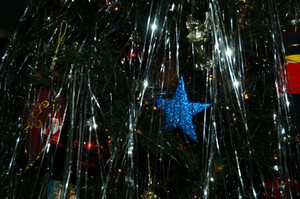 Happy holidays to everyone....and please continue to support Menu For Hope III . Sift flour into bowl, rub in butter, add sugar, egg yolk and enough water to mix to a firm dough. Knead on a lightly floured surface until smooth. Cover and place in fridge for 30 minutes. Roll pastry between two sheets of plastic food wrap to about 2.5mm thickness. Cut into rounds large enough to line patty tins. Fill with Fruit Mince (my fruit mince was a gift from Emma). 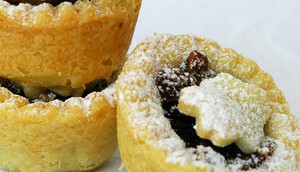 Top with pastry or leave plain. Bake in a moderately hot oven for 10 minutes. Cool in tins before removing. Serve with icing sugar if topped or a spoonful of whipped cream if plain. If you have arrived here after reading the article in the January issue of the BBC magazine Olive - welcome and I hope you enjoy your time here. Since the article was written, Newmarket Fresh has unfortunately gone out of business. However a super new place has opened in Newmarket - Jones the Grocer . You can read my impressions here. Thanks for dropping by Winos and Foodies, leave a comment if you wish and please drop by again. Visit Graham at Noodle Pie and see which other bloggers were invited to participate in the article. ...and here are a few pictures of the evening. ......and please support Menu For Hope III . Could you help us feed the world's hungry? Over 90 percent of the world's hungry are prisoners of poverty. They are too poor to buy enough food. They spend all their time and energy trying to survive. WFP's innovative food aid projects not only put food on the tables of the weakest and poorest: jobless mothers, school children, landless farmers and HIV orphans. They also help the hungry to secure food and an income by themselves, so they can break out of the poverty trap and build a sustainable future. Menu for Hope is an annual fund raising event, originally devised by Chez Pim. Last year the campaign raised US$17,000 for UNICEF in just twelve days. In 2006 we will be raising funds to support the United Nations World Food Programme. As you make plans for your holiday celebrations whether it be Christmas , Hanukkah , Kwanzaa or maybe just an end of the year party, take a moment to think about those 90 per cent. Don't let them go hungry. Help us to help them. Bloggers from the Food and Wine blogging community throughout the world have pledged prizes which will be raffled on line. You can purchase a ticket or tickets at US$10 each. Each prize has a unique number and you must quote that number when you go the First Giving web site to purchase your tickets and make your donation. All ticket monies are collected by the on line fund raising company First Giving on behalf of Menu For Hope. This year the world has been divided into regions. You may purchase tickets for any prize from any region provided they are prepared to ship to your destination. I have donated this cook book as a prize and I am happy to post it to any place in the world. The cook book Taste Favourites is a mouthwatering compilation of recipes from four of New Zealands best food writers - Laurie Black, Allyson Gofton, Tracey Sutherland and Jennifer Yee. 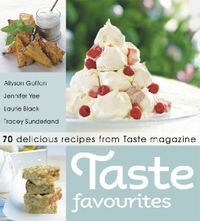 All are contributors to the very successful New Zealand Taste magazine. 2. Make a donation, each US$10 will give you one raffle ticket toward a prize of your choice. Please specify which prize or prizes you'd like in the 'Personal Message' section in the donation form when confirming your donation. Do tell us how many tickets per prize, and please use the prize code -for example, a donation of $50 can be 2 tickets for AP01 and 3 for AP02. The website where you can purchase tickets on line. Helen of Grab Your Fork is the regional host for the Asia Pacific region. 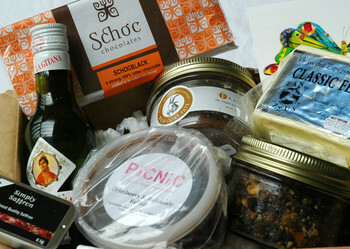 This site has the list of prizes donated by food and wine bloggers in this region. Pim of Chez Pim is the organiser of Menu For Hope, now in its third year. Go to her site for a full list of the prizes available world wide. TELL YOUR FRIENDS AND WORKMATES ABOUT US AND HELP US TO FEED THE WORLD'S HUNGRY. Slashfood published this article on peppadews. I thought I'd share the nibbles I served this week using these very Christmasy little peppers. It is very simple. 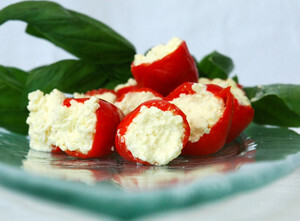 Stuff the peppadews with a blend of feta and cream cheese. Add other flavourings like herbs if you wish. UPDATE: Read about peppadew on Wikipedia . Peppadew is a trademarked name and has no 's' on it. 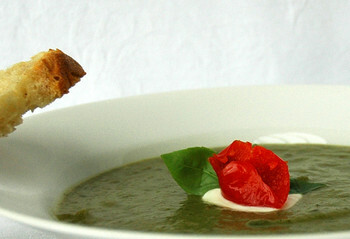 Here is my entry for Tami's one off blog event, the soup challenge. I'm a bit like Tami's Mum in that nothing is ever written down, I don't measure ingredients and I use whatever is around at the time. My veggie man at the market did not have any watercress this week and suggested I try Chinese water spinach in its place. There were a couple of zucchini rolling around in the fridge so I added those as well. When making soup I always start with softening an onion and a clove of garlic. Then I add whatever vegetables I'm using. Today it was water spinach and zucchini. Because I was using veggies that would make a thin soup I added a couple of cubed potatoes as a thickener. Add as much salt as you need to. Cover with water or stock and boil briskly until vegetables are soft. 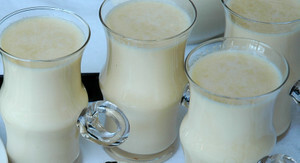 Cool and then blend until smooth. Quantities will vary depending on how much soup you want. Today I served it decorated with a little yogurt some basil leaves and a peppadew. It was during this week in 2005 Van Tuong Nguyen died in Singapore. At some point in his young life he hooked up with the wrong people, became involved in drugs and was caught carrying drugs from Cambodia to Australia. He was executed at 11.00AM New Zealand time, and at that moment I was sitting in my oncologists waiting room for a follow up appointment to my 6 monthly CT scan. As I waited I was thinking about the Nguyen family and in particular his mother. I said a quiet prayer for her, asking her God to give her strength and courage to face that terrible moment in her life. The next moment I was sitting in front to my oncologist hearing news which was not good. I had developed a secondary cancer and would require surgery and a second round of chemotherapy. I cancelled a lunch appointment I had for one o'clock, went home and waited for the surgeon to call. While I waited I baked .....Panettone , Pavlova , Pita . A few days later I packed my Bag and went to hospital. My surgery was followed up with 18 three weekly cycles of chemo. I didn't feel like spending any time in the kitchen and most days I didn't have the strength to lift my camera to take photos of any baking. I spent most of the next 8 months on the couch in front of the TV watching the cooking channel. Twelve months after that awful day, I'm on three monthly check ups, hopefully the chemo will have taken care of any further cancer cells, and I'm facing the world again. Apart from some lingering side effects of the chemo which make life a little uncomfortable and may take up to 12 months to disappear, life is good. I have decided I'd make the baking of Panettone an annual event at this time each year. 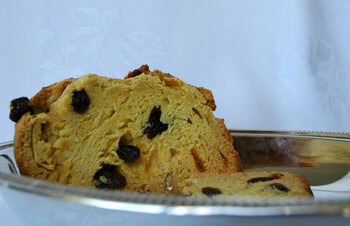 Panettone 2006 was a bit of a disappointment as it did not rise as it should. It still tastes like a panettone should and I could easily eat the lot, if Bryan doesn't beat me to it. The added bonus of baking panettone is the house smells deliciously of sugar and yeast and lemons. I won't share the recipe as I'm not sure if it is the recipe or bad yeast that is the problem. I've been tagged by Roger at Go Provence for the meme to list 10 things you would never do. 1. Never wear a mini skirt. 3. Never say no to a glass of vintage champagne. 4. Never take the elevator when I can walk. 5. Never forget the friends who were there for me when I faced cancer. 6. Never stop being grateful for my husband and children. 7. Never forget the emotion of arriving in Santiago de Compostella after 6 weeks of walking. 8. Never stop loving the sunshine. 9. Never stop wanting to walk on the beach in any weather. 10. Never be afraid of travelling. I'm tagging our latest food blogger in New Zealand - Morven . Cenzina has posted the Hay Hay Its Donna Day Roundup #8 . Please take a moment to read them and cast your vote before 10th December. The winner will receive a Box of goodies from the generous people at San Lorenzo . I wonder who will get their Blog By Mail post up first. Maybe others are typing as I type? Maybe some are already up? I have two reasons to thank Emma . Firstly she was the organiser of the New Zealand Blog By Mail. Secondly I was the recipient of her package. Thank you, thank you Emma. See the fabulicious booty Emma sent. 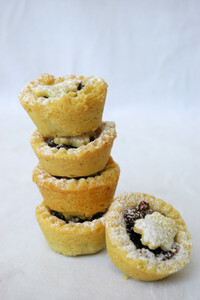 I have just made Christmas mince pies with the fruit mince which we will eat this evening with a glass of sherry from the dear little bottle Emma found. I need to get more of them as I'm a bit of a sherry fan. Not my Mum's cooking sherry I must say, but the real deal like the Manzanilla La Gitana from Bodegas Hidalgo Emma sent. A few strands of the saffron will be melted into a sugar syrup to add to the egg nog tonight. Did you know saffron is being grown in New Zealand? Simply Saffron is from the Hawke's Bay. I simply heart Schoc and this is 100% bitter chocolate. I've maxed up to 85% chocolate so this will be interesting when I try it this evening. Can you believe I have held off on eating any of the goodies Emma sent. Apart from a teaspoonful of the fruit mince. Just to check it was okay! 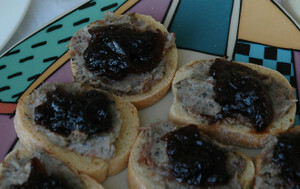 Emma also sent some Wild Goat Paté made by François in Wellington which we will have before dinner this evening on toast croutons along with a little of the Cranberry and Balsamic Relish from Picnic in Paekakariki. The Zany Zeus feta I intend to stuff into some little red pepper dews I have waiting in the cupboard. This first New Zealand Blog By Mail has been a lot of fun. I got to post a package to Nigel at Curious Kai . What do you send a man who eats these? Thanks Emma for organising the first NZ Blog By Mail. You've probably noticed I've made a few things from Taste magazine recently. Well it is because they have been running a photo competition where the three pictures with the most votes win a cook book. Like I need more cook books. I do I do. You can never have too many cook books I say. The family have enjoyed some excellent cakes the past month as I did my best to make the final eight. Remember this Apple Cinnamon Cake ? It was selected. You can view all the finalists here and then vote for your favourite here.